If you weren't aware, Ferrari offers the filthy rich several ways to trade said riches for the privilege of flogging Ferrari racecars on tracks around the world. Check out the scene inside the company's il Reparto Corse Clienti, where private clients' cars get the prancing horse treatment. Among Ferrari's non-competitive owner programs, the "F1 Clienti" program is like the über-platinum club. The world's bigwigs like Benjamin de Rothschild can buy an F1 car of any era since 1970 (new cars go on sale after a two-season moratorium), then pay Ferrari for a full support crew and transportation to eight driving events throughout the year, held around the world — on tracks like the Nürburgring, Fuji, Circuit Paul Ricard and Mugello. The cars' starting prices are in seven figures, and the running costs are astronomical by regular-Joe standards, extending well into private aircraft range. For the money, driver/owners get the VIP treatment from a full crew of mechanics and handlers, just like a pro driver would. The Reparto Corse Clienti not only houses clients' F1 cars, it's also the nerve center for everything needed to keep them running, from countless versions of long-since-outdated software, to all the specs needed to rebuild any part of any of the company's F1 cars — at least the ones built since Jacky Ickx returned to the team during the first Nixon administration. Rothchild, for example, keeps two cars, one of Felipe Massa's 248 F1s from 2006 and one of Rubens Barrichello's F2003-GAs; Californian Tony Nobles — one of the program's first clients — drives one of Michael Schumacher's F2001s from 2002, while global amusement park mogul Giancarlo Casoli fields one of Niki Lauda's 312Ts from the mid-1970s. Not all F1 Corse Clienti clients house their cars at Maranello. 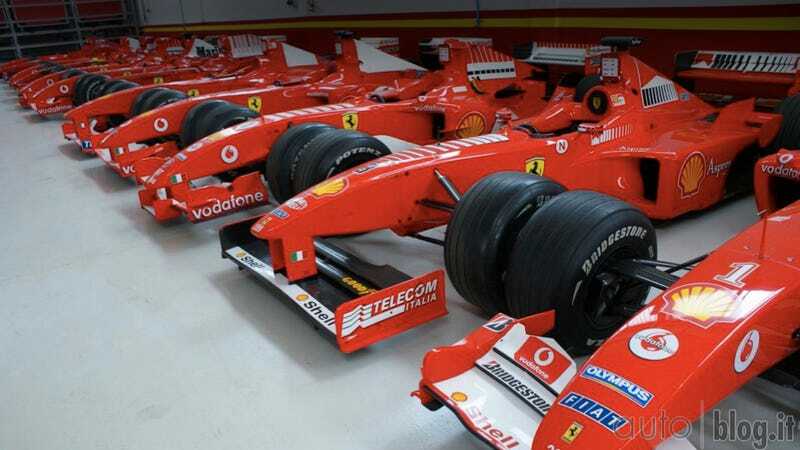 As Autoblog.it points out, the oldest spied in these shots is the F310 from 1996, and most recent is Kimi Raikkonen's F2008. Lower down on the Corse Clienti spectrum are the FXX and 599FXX programs. It's been said that FXX owners pay around $2 million for the Enzo-based racecar, which is maintained at Reparo Corse Clienti, and related services. Owners also agree to participate in Ferrari's R&D program, where they essentially act as test drivers, providing feedback to engineers. In 2010, Ferrari added a GT-car element to its private-client program, with the 599FXX. The invite-only program reportedly cost clients a similar $2 million, although the actually dollar figures are held as tightly as state secrets. With Ferrari opening the doors to its workshop for a recent visit from journalists, we can only assume that the company is preparing for its next phase of Corse Clienti programs — i.e., the FXX replacement. For a hint at what's next for the company's well-heeled clients, we'll have to wait until the next Ferrari supercar, which is at least a year away.